Tottenham Hotspur are to lodge an appeal with the Premier League for striker Harry Kane to be awarded the winning goal against Stoke. 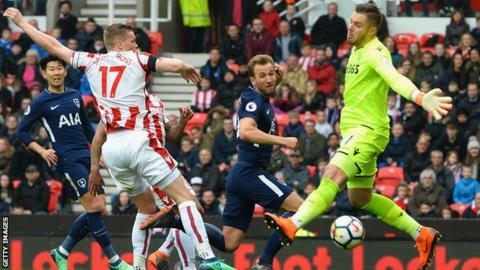 Kane claimed the second goal in the 2-1 win at the Bet365 Stadium on Saturday. However, the Premier League Goals Accreditation Panel gave it to midfielder Christian Eriksen. If England striker Kane is awarded the goal, it will take his season tally to 25 - four behind the league's leading scorer Mohamed Salah of Liverpool. Egypt forward Salah, 25, is on course to win the golden boot - awarded to the Premier League's top scorer - in his first season at Anfield. Spurs' decision to appeal means footage of the goal will be reviewed again by different panel members. At Stoke, Denmark international Eriksen was accredited with both goals as fourth-placed Spurs made it six straight league wins to stay on course for a place in next season's Champions League. Kane, 24, said after the game Eriksen's free-kick grazed his shoulder before crossing the line. "I swear on my daughter's life that I touched the ball, but there's nothing I can do," added Kane. "If they turn it around, they turn it around. If they take my word, they take my word. "It is what it is - the most important thing is that we won the game." Meanwhile, Kane is confident he can eclipse Salah to win the golden boot. Kane is bidding to become the first player since Thierry Henry to finish as the Premier League top scorer for a third consecutive season. "I still believe I can. There are still games to go," said the striker. "I've got to focus on my game. I can't control what he does.